George Herbert Walker Bush served one term as president after Ronald Reagan’s two-term presidency. In addition to being the 41st president of the United States, Bush had served as an ambassador, congressman, and director of the CIA. Bush is one of two presidents whose son followed in their presidential footsteps. When Bush was 18, the Japanese attacked Pearl Harbor, and he decided to join the Navy, where he was commissioned as a naval aviator. He served until the end of World War II. He attended Yale University and graduated in 1948 before moving to West Texas and joining the oil business. His business quickly became successful, and by age 40, Bush was a millionaire. At Yale, Bush was involved in various activities, including cheerleading and baseball. He was also the president of the Delta Kappa Epsilon fraternity and a member of the Skull and Bones Society. In 1945, even before attending university, Bush married Barbara Pierce and they had six children. One child died of leukemia at a young age. 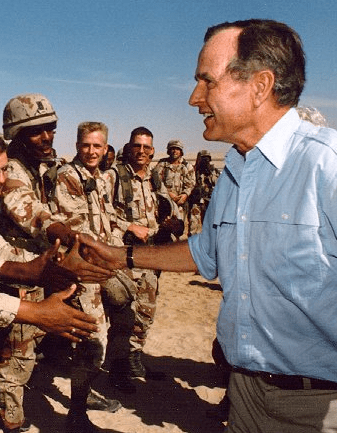 President Bush greets troops in Saudi Arabia, 1990. Photo courtesy Bush Library. After serving in the House of Representatives, Bush was appointed as the vice presidential nominee by Reagan and the pair was voted into office. After Reagan’s presidency, Bush successfully campaigned to succeed him in 1988. In fact, the last sitting vice president to win a presidential election had been Martin Van Buren in 1836. Only two other sitting vice presidents have gained the same distinction. During Bush’s presidency, he focused largely on foreign policies. Various world events occurred during this time, including the U.S. invasion of Panama and the Persian Gulf War. Additionally, the fall of the Berlin Wall and the USSR dominated world headlines and served as a backdrop to Bush’s presidency. Bush became infamous because of a promise made while campaigning for the presidency that he would not raise taxes. However, because of economic reasons, his administration was forced to increase taxes, inciting anger from the American public. In 1992, he lost the re-election to Bill Clinton. As an 18-year-old naval aviator during WWII, Bush became the youngest person assigned to the position at the time. During his time at Yale, Bush met baseball legend Babe Ruth, and he even took a photo with him shortly before Ruth died. After Bush left office, he took part in several parachute jumps over the years, an unusual hobby for a former president. Bush originally ran against Ronald Reagan during the 1980 Republican nomination. He defeated Reagan in the Iowa caucuses, but it was not enough to gain the nomination, and Reagan ultimately won.